California’s lengthening drought is focusing new attention on sustainable landscaping, as homeowners try to balance maintaining an attractive yard with the critical need to conserve water. Sustainable landscaping is much more than simply choosing a desert motif and packing your yard with cacti and succulents. It includes lawn-care practices that are sensitive to the environment while delivering surprising health benefits. Environmentally friendly landscapes can cool the area around homes and office buildings, reduce air pollution and dust, build healthy soil, reduce runoff and erosion, attract wildlife, and produce oxygen. The University of California’s Division of Agriculture and Natural Resources website offers urban-landscaping advice, including gardening and irrigation tips, water-wise plants, and a lawn-care guide. Scroll down the Drought Information page and check out the links under its Landscape and Urban section. Test your soil: Check the pH level of the soil to ensure that you have a healthy yard. Either have a professional do it or get a test kit from your local agricultural extension office. Plants won’t grow well if the pH balance is off. Put the right plants in the right places: Place shade plants in shady areas and those that need sun in bright locations. Doing so will create less stress on the plants and help to keep them disease-free. 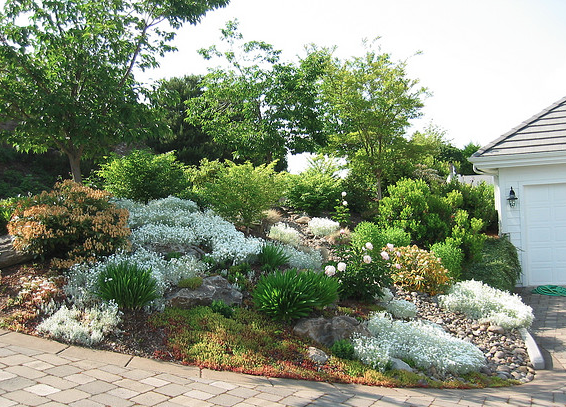 Use less water: Look for plants and grasses that require less water. Also, water your lawn and garden either early in the morning or late in the day, and water less often but for a longer time. Build healthy soil: Healthy soil is necessary to grow healthy plants, but it also supports microorganisms and results in plants that are less susceptible to disease and pests. Healthy soil also produces more oxygen, sequesters more carbon, and supports local animals and insects that help keep the ecosystem healthy. Protect wildlife: By offering animals and birds food, shelter, and water, homeowners can have a large impact in the survival and health of urban wildlife, which studies have shown is adversely affected by development. Caution with pesticides: Misusing pesticides can harm both people and animals and can taint water supplies. Apply pesticides only as a last result and by follow the directions exactly. Mow and prune the right way: Correct mowing and pruning can help minimize pesticide, water, and fertilizer use which in turn lessens the chance of polluting the water. Cut down on stormwater runoff: By preventing stormwater from running off onto neighboring yards, homeowners can help stop flooding, erosion, and water pollution; restock groundwater supplies; and benefit wildlife habitats.